With a shorter, lock free run to do, we were in less of a hurry this morning. This was just as well, as, after waking at six and reading for a bit, I dozed off again and didn't come to until twenty past seven. So it was a case of tea whilst getting dressed, scoff breakfast pronto and then head over to the water point by Bridge 68 to fill the tank. The pressure is really good here and we took on three quarters of a tank in the time it took to make and drink a mug of coffee and deal with some email. Off we went again, Sheila steering and your correspondent dividing his time between looking out, pottering in the cabin and, later on, doing the washing up. Sheila was well on form, handling the tricky bridge hole at Congleton High Town with skill and aplomb despite the anxious looking privateer hovering on the towpath just the other side. She then cleared the aqueduct without touching the sides, too. 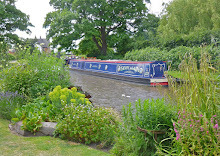 Our original plan had been to return to Scholar Green, but with no shopping to do there was no reason not to stop at the peaceful visitor moorings by Bridge 86, the ones we know as the Little Moreton Hall moorings as you can walk to that spectacular National Trust property from here. The sun has come out, Sheila has started a new crochet order and I've been loafing, quite frankly. Oh, except that we counted up the money raised by the charity auction. Once I've banked the cheques, the Anthony Nolan charity will be better off by over £1200 plus the Gift Aid.